The benefits of Adventure Activities include increased physical fitness and positive attitudes to outdoor activity. The Go4it Adventure Activities programme is delivered by Hollingworth Lake Activity Centre. This has been established for over 20 years and the centre holds an Adventure Activities Licensing Service (AALS) license allowing it to provide adventurous activities for people under the age of 18. This ensures standards of safety provision, suitability and condition of equipment and qualifications of instructional and safety staff. Suitable for a wide range of ages and abilities, they can also make an important contribution to supporting healthy lifestyles in young people and building confidence and self esteem. Located on the edge of Hollingworth Lake, the centre was extensively extended and refurbished in 2009 providing a new indoor teaching area and increased changing and equipment facilities. A new indoor climbing wall, built in 2010, is now also available nearby at Littleborough Sports Centre. Clear pupil progression is provided across the key stages from introductory level for children aged 4 and over to post-16 instructor qualifications. Outdoor activities fit into the National Curriculum from a very early age. From Physical Education at key stage 1 and 2 through to GCSE's and A levels. There are also many universities offering degree courses in outdoor management and leadership. At Hollingworth Lake we support the National Curriculum at all levels from water safety at key stage 1 and outdoor adventurous activities at key stage 2 through to GCSE's in Sailing, Climbing, Kayaking and Mountain Biking. The centre has also developed excellent team building experiences for organisations & groups. Please click here to read more about our adventure activities. Our mini splash/rafted canoe sessions are unique and swimming ability is not essential. A child's first venture in to open water can be quite a daunting adventure but these sessions are specifically designed to instill confidence in even the youngest participants from age 4. The children are fully kitted out in wet-suits and buoyancy aids and are coaxed in to the water gradually using games and lots of splashing. This then leads to the opportunity to experience floating in the shallows and learning how our buoyancy aids can keep us safe. By the end of the hour long activity the more confident children are usually jumping in! An adaptation of this activity for slightly older children takes place in rafted canoes. This gives the children the opportunity to paddle a boat on the lake with lots of opportunities to play games and jump in. 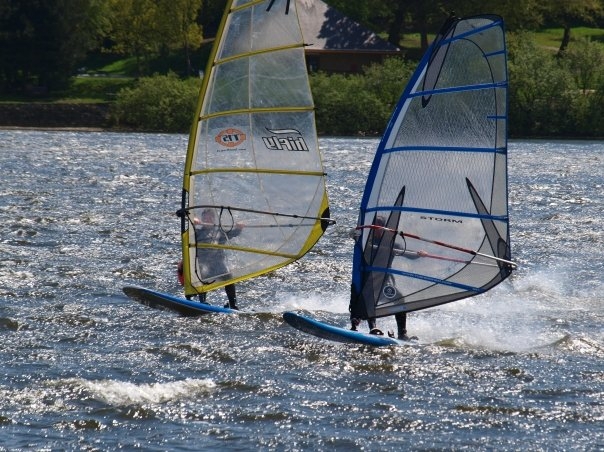 The centre offers taster sessions in all of our activities, and is a great introduction to the different sports available at Hollingworth Lake. The sessions are two hours long which gives the pupils enough time to get to grips with the basics. These slots can be booked either as a one-off or as a multiple booking combining a number of the activities (i.e. a wet activity and a dry activity). The tasters are ideal for schools that are looking for something different for the children to try or could even be used as an end of term reward or incentive for the pupils. The centre has a range of bikes and sizes to fit all and is in the enviable position of being on the edge of the Pennines where there is access to a number of fantastic cycle routes. The instructors are qualified to teach everything from national standards cycling proficiency to mountain bike skills. We can also bring our bikes to your school with our 12 bike trailer, which is ideal for teaching younger children national standards in playgrounds and on local residential streets. From the age of 8, children can start working towards nationally recognised qualifications in sailing, windsurfing, kayaking, climbing and mountain biking. These courses offer the opportunity for real progression within the different disciplines with the emphasis still being on fun. Generally run over 6 weeks (2 hours a week) the courses fit in nicely with an average school term and can either be linked in to the national curriculum or delivered as an extra-curricular activity. The course can be run during school times or after school. The centre can provide a comprehensive GCSE programme for schools in a variety of sports. We can tailor our programme to fit in with all the examination boards and their marking criteria within physical education and can work alongside teachers to ensure the pupils attain the necessary grades. Every year we successfully guide dozens of pupils through our adventurous activities GCSE courses in a fun and informative way and alongside the GCSE qualification many of the children leave having gained a national governing body award also. The courses are generally run over six weeks (2 hours per week) and usually run during term times. The activities at the lake have many benefits as a GCSE option; often many pupils who either do not excel at traditional sports or engage in team orientated sports find they have a more natural ability when participating in individual activities such as sailing or kayaking. The Duke of Edinburgh programme is relatively new to the centre and is already proving to be extremely popular! Utilising our fleet of specialised mountain bikes, the centre can deliver expeditions with a difference. We offer a comprehensive training and expedition package that supports the overall DofE programme. We can cater for groups of up to 12 and can provide a full training programme that focuses on riding skills, navigation, maintenance, team work, incident management, camping skills followed by a practice weekend that culminates in the full 2 day assessment expedition. As a registered DofE Centre, we can offer opportunities for children to undertake the other three elements of the DoE programme (Skills, Physical and Volunteering). We can support schools already involved with offering DofE as well as individuals wanting to get involved. Each year Hollingworth Lake welcomes students to the centre for their work experience which can be either 1 or 2 weeks. This has often led to paid employment in the future with several students coming back once they have left school. We have had students ranging from high school to undergraduates completing their work experience with us and all have left having had a wide ranging and comprehensive introduction to the work place and the outdoor activities industry. Our team has put together an excellent work experience package that ensures the individuals leave having gained a great deal of knowledge. Work experience at a multi–activity centre is a fantastic and fun opportunity for any one looking for an introduction to work life. Many of our staff start working with us often as they leave school or start college. There are opportunities at Hollingworth Lake for school leavers to begin employment at the centre in a non-instructional role, e.g. looking after our rowing boat fleet during the school holiday periods. These roles can often lead to further prospects within the company such as the chance to gain the Level 2 powerboat qualification or even trainee instructor posts, if the individual is showing a particular interest in one of the sports at the centre. In order to become an instructor you need more than just your qualification, you also need to gain experience in delivering sessions. Many NGB qualifications require a consolidation period after training. The best way to do this is to shadow experienced instructors on sessions and learn from them. At Hollingworth Lake, positions occasionally arise for trainee instructors. The positions will give you the chance to build your confidence with opportunities to instruct during the sessions. Along with this invaluable experience, you will also learn about how a centre is run and what is required of an instructor working in the industry. Hollingworth Lake Water Activity Centre is very proactive about providing accessible activities for people with disabilities. There are a wide range of activities available including sailing, canoeing and kayaking together with climbing. Activities can be developed to be suitable for people who just want to "come and try", through to people wanting to do personal performance awards. Staff at the Centre have received an extensive amount of training and specialist equipment is available for supporting people.